As Christie’s sell the statue of Sekhemka for £15.7 million, world famous graphic novelist Alan Moore torpedoes a key Government culture policy, Egypt protests, whilst the International Council of Museums condemns Northampton’s sale of the statue. Meanwhile, serious questions remain about the precise legal and financial arrangements reached between Northampton Borough Council and the Marquis of Northampton to split the proceeds of the sale and the Marquis of Northampton’s estate office burns. There was an elephant in the auction room as the hammer came down on the £15,762,500 sale of the 4000 year old statue of the Egyptian Royal scribe Sekhemka at Christie’s. Not just the protester who briefly interrupted the auction demanding that “no-one should bid or buy it…stolen property”. The elephant was a question. If Northampton Borough Council owned Sekhemka and had the right to sell him, a perception reinforced by the fact that Christie’s described the Council as the seller in its press statements and the Council had announced it is paying all the auction costs and taxes. Why on earth were the Council then going to pay the Marquis of Northampton 45% of the proceeds of the sale, over £5 million? The elephant ambled out into the West End evening even as TV crews from the BBC and Al Jazeera filed their pieces and the small but committed and vocal group of Egyptian protestors rolled up their flags and placards and dispersed under the good humoured gaze of two of the Metropolitan Police’s finest [and the slightly less good humoured gaze of several of Christie’s heaviest; bouncers that is]. “This money will allow us to realise our exciting plans for the future of the Museum Service. Every penny is ring-fenced for the Museum Service and we will now make our museum redevelopment plans a reality.” Said Head Elephant Keeper and architect of the sale of Sekhemka, Councillor David Mackintosh, the Conservative Leader of Northampton Borough Council. Indeed Councillor Mackintosh’s achievement in obtaining a record price for such a statue was a major success for the single minded politician. 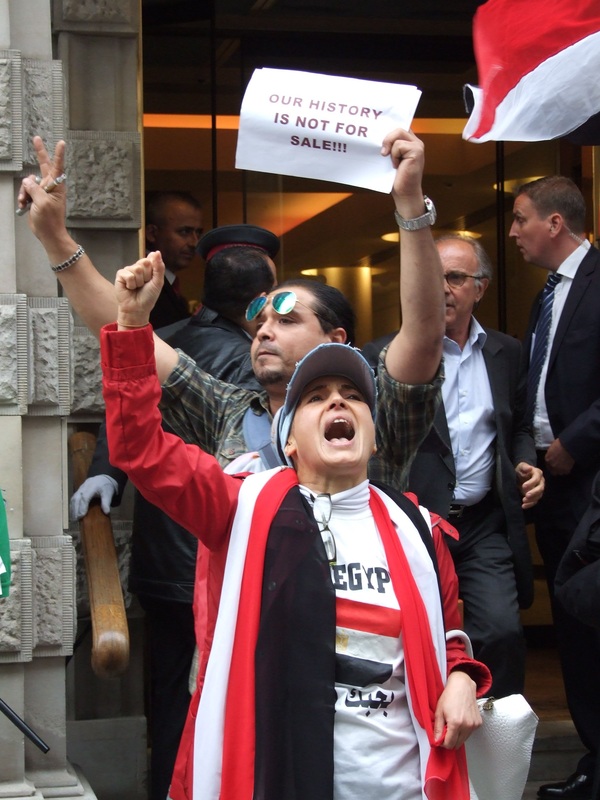 Especially given the pressure to cancel the sale which had been growing throughout the week, ever since the Egyptian Government announced it was considering taking legal action to stop the sale on Monday. Even so, and in spite of reports that Councillor Brandon Eldred, Northampton’s Cabinet Member for Community Engagement, was in Town for the auction [and apparently stopping overnight, presumably to recover from the excitement of all those zero’s] Northampton’s two leading politicians had uncharacteristically shied away from talking to local and national Media, except in pre-recorded packages or short and tightly on message interviews such as that given by Councillor Mackintosh to BBC Radio 4’s flagship lunchtime news magazine the World At One on Wednesday. “…undercutting one of the fundamental principles by which museums acquire artefacts in their collections. “One of the reasons such people choose to live here is our world-beating cultural scene and there’s no reason why they can’t do more to support it. Sir Michael and Lady Hintze recently made headlines with their extremely generous £5 million unrestricted donation to the Natural History Museum. “Northampton Museum is owned and run by the Borough Council, and any decision on whether to sell assets is for them to decide. However they may risk losing accreditation from the Arts Council. As if the story was not already sensitive enough in UK terms, the Sekhemka furore will probably also be attracting at least passing attention on the Egypt Desk at the Foreign Office with the Egyptian Ambassador to London, His Excellency Ashraf el-Khouly, quoted as saying “Museums should spread culture, not sell heritage for money.” and with the story receiving extensive coverage in the Egyptian press. 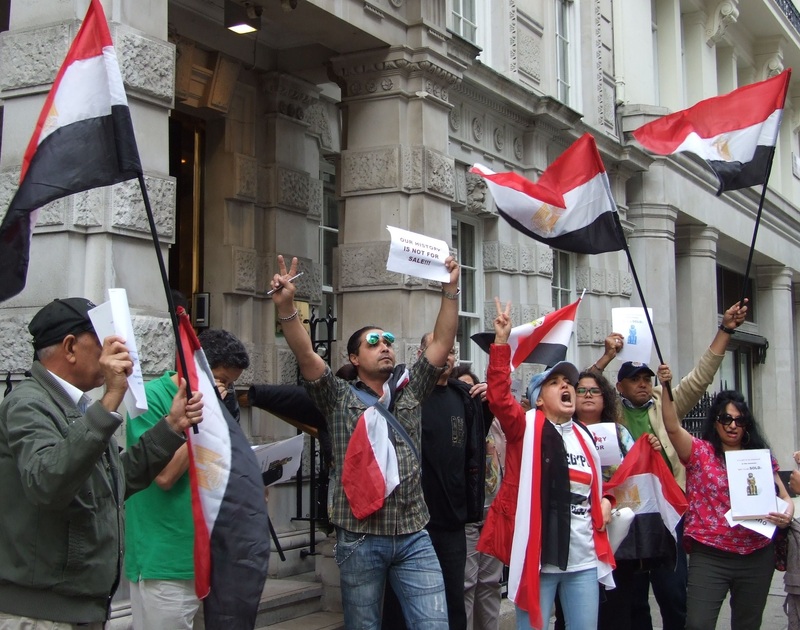 With the political situation in Egypt and the Middle East so sensitive it is most unlikely that any situation which can be presented as Britain disrespecting Egyptian cultural sensitivities, however unintentionally, would be welcomed in Whitehall. By a complete, but remarkable coincidence the auction also came on the anniversary of the bloody Battle of Northampton in 1460, and just a day after the Cabinet of Northampton Council voted to adopt a conservation plan for the Wars of the Roses battlefield which would see the site turned into a heritage attraction. Critics of the Sekhemka sale argue that the loss of Museums Association accreditation which Arts Council England and the Museums Association have warned is the almost inevitable result of, what they term, the “unethical” sale of Sekhemka, would have a knock on effect, making raising funds from public and charitable bodies for all other Council driven heritage projects in Northampton very difficult. All just as other local authorities in the East Midlands prepare to cash in on the expected increase in tourism generated by the reburial of Richard III at Leicester. Earlier Councillor Mackintosh told the BBC that the Council had kept “Arts Council England informed of our actions and plans… we see no reason why we should not retain our accredited status”. Unfortunately the implied innocence of this “what me unethical guv, I blame the Arts Council for not understanding me” approach is most likely designed to prepare the ground for the same kind of feigned hurt and withdrawal from the Museums Association undertaken by the Conservative administration of Croydon Council after the sale, also at Christie’s, of part of the donated Riesco Porcelain collection in November 2013. Croydon withdrew from the Museums Association before they could be expelled. “Those who choose to approach the sale of collections will only further alienate both key funders and the public who put their trust in them to care for our shared inheritance. …and it is widely felt that both organisations would lose all credibility in the heritage sector if, having marched to the top of the removing accreditation hill, they marched back down again and let Northampton and Councillor Mackintosh, off the hook. In a final bizarre twist to the Sekhemka story so far, observers have pointed to the other remarkable coincidence that the day before the sale, [9 July 2014] saw a serious fire at the estate office of Castle Ashby, the Northamptonshire estate of the Marquis of Northampton. Beneficiary of that elephant sized secret deal by which the Marquis stands to gain 45% of the money raised by the auction, which could now be well over £5 million. This arrangement has come about because Sekhemka was donated for free to Northampton Museum by the Marquis’s Great Grandfather on condition it remained on display for the enjoyment and education of the people of Northampton. Although Northampton Council have repeatedly claimed to “own” Sekhemka and appear as the vendor of the “Northampton Sekhemka” in Christie’s, catalogue and media statements, there is a school of legal opinion which cites a 19th century Deed of Gift published by the Museums Association in the run up to the sale [ http://www.museumsassociation.org/download?id=971204 ], to suggest that the true owner was actually the Marquis. By this analysis Northampton Council’s ostensible “ownership” is in fact a legal and financial fix to facilitate the sale to benefit both parties. While there is no evidence that anyone has done anything unlawful regarding the sale of Sekhemka, all three parties involved, Northampton Council, the Marquis of Northampton and Christie’s, have steadfastly refused to release the full documentation and legal advice for independent scrutiny in spite of the fact that another Freedom of Information Act request shows that Northampton Borough Council spent over £40,000 of public money on legal costs to facilitate the sale. Others might suggest, not altogether tongue in cheek, that this mercenary treatment of the statue which was meant to embody Sekhemka’s existence in the afterlife is more than enough justification for the scribe’s homeless and angry shade to wander by Castle Ashby with a box of matches and make his feelings known? Meanwhile, away from the twilight zone of coincidences and ancient curses, back at Northampton Borough Council, there is no confirmation that Alan Moore is considering writing a new book set in a dystopian cultural wasteland. However, the elephant has left its deposits all over the story of the Council, the Marquis and the statue of Sekhemka and at some point someone in the Council will have to clear it all up. Although the elected pooper scooper will almost certainly not be Councillor Mackintosh who is Prospective Parliamentary Candidate for the Conservative seat of Northampton South at the May 2015 General election, and maybe not the Conservatives Party either. If Croydon is a precedent Cllr Mackintosh’s Party colleagues may well have noted that the ignominy of the sale of the Riesco Porcelain coupled with other misdemeanors and incompetence’s, led to the Conservatives losing office at the subsequent local election. Mind you, whoever gets the clean-up job at Northampton Borough Hall, it may well need less a new museum than a Pharaoh sized shovel. Andy Brockman is an archaeologist, writer and campaigner on heritage issues. He has been working with the Northampton Save Our Sekhemka Action Group campaigning against the sale of Sekhemka.